But it is the 1939 film version – legendary for, among many things, its inimitable cast, its unforgettable score by Harold Arlen and E.Y. Harburg, and its innovative use of “glorious” Technicolor and special effects – that endures as the Yellow Brick Road gold standard. So it is no small compliment to say that the Paramount Theatre production of the musical (in John Kane’s Royal Shakespeare Company adaptation) not only lives up to that film in countless ways. But what’s more, director-choreographer Amber Mak and her sensational team of 30 actors and a slew of designers magically pay homage to the movie classic’s emotional richness, while at the same time incorporating some of the newest tricks of technology. 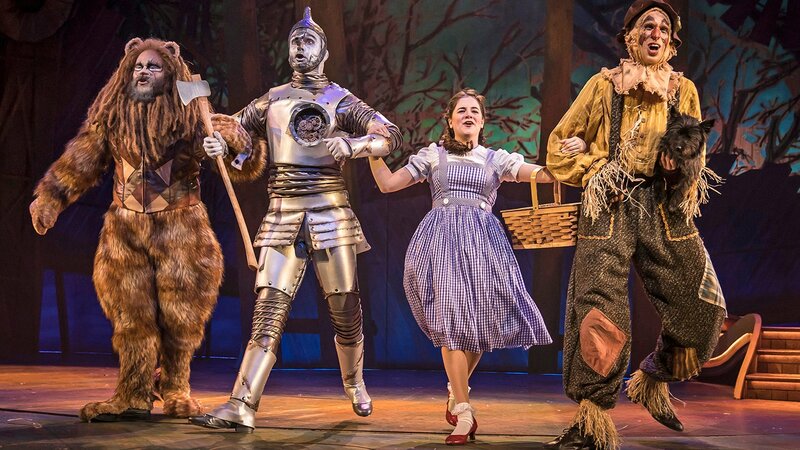 The result, on all counts, is a Broadway-worthy show of grand scale and exceptional imagination – a production that spins onto the stage with the force of the cyclone (even if some insist the proper term is tornado) that knocks out Kansas farm girl Dorothy Gale just long enough for her to take a scary but fantastical journey to the Land of Oz and Emerald City. There is no need to recount the story – it has been this country’s defining fairy tale for more than a century – so let’s just jump into the genuine beauty of this show. To begin with, there is Elizabeth Stenholt’s wonderfully natural, warmly sung performance as Dorothy. Stenholt left a vivid impression as Wendy in Chicago Shakespeare Theater’s recent production of “Peter Pan.” And in this role (with her uncanny physical resemblance to the young Judy Garland) she brings a similar mix of inner strength, independence and directness. Without question an actress to watch. And of course there is the irresistible trio of friends she makes on her way to Oz, all of whom are versions of the farmhands who work for her no-nonsense Aunt Em (Harriet Nzinga Plumpp, who morphs into an elegant, notably saccharine-free Glinda, the Good Witch of the North) and Uncle Henry (Steve O’Connell, who deftly turns into the fast-talking Emerald City Guard). As the Scarecrow in quest of a brain there is the tall, impossibly rubber-legged Kyle Adams. As the Tinman in search of a heart (and an oil can), there is Carl Draper, a terrific tap dancer. And as the Cowardly Lion yearning for courage there is Paul-Jordan Jansen, the formidable actor who starred as Sweeney Todd at Paramount a couple of seasons back, and who here brings his grand voice, muscular build and sweetly sly sense of humor to this character who can easily scare himself. All three stamp their distinctive personalities on the roles, and further delight audiences as they move into the theater’s aisles. Caron Buinis brings just the right haughty officiousness to the snobby, dog-hating Miss Gulch, and easily shifts into her Oz incarnation as the Wicked Witch of the West. And Nessa, a well-behaved charcoal-colored cairn terrier, is a top-notch, flesh-and-blood, four-legged performer as Dorothy’s beloved Toto. And then there is that ever-masterful Gene Weygandt as Professor Chester Marvel, the wise but wilt fortune-telling con man who travels across the Kansas prairie and then turns into yet another humbug – the Wizard of Oz. But beyond these actors, and an exuberant ensemble that plays everything from the Munchkins (a mix of children and adults) to those multi-legged creatures, the Jitterbugs, to the Winkies, the uniformed marching guards enslaved by the Wicked Witch, there are the show’s ever-moving design elements which are as deftly choreographed as the performers. They unwind like a perfectly synchronized perpetual motion machine and suggest the disorientation that can come with both a momentous storm and a concussion-induced dream. The massive set, co-designed by Kevin Depinet and Christopher Rhoton, and with vivid lighting by Greg Hofmann, is a marvel of large, shattered farmhouse planks, with an inventive, snake-like, revolving Yellow Brick Road construction, an impressive gate to Oz and a wide open Kansas landscape with giant windmills that can just as easily become a sleep-inducing field of giant red poppies thanks to Dorothy’s dream. Kevan Loney’s demonic projections and Adam Rosenthal’s sound effects add a stormy electric quality to crucial scenes. There are scores of Technicolor costumes (including couturier green satin outfits for the Emerald City inhabitants), by master costume designer Theresa Ham, plus fantastical wigs and makeup by Katie Cordts and puppets by Jesse Mooney-Bullock. And each and every element is brilliantly integrated. Last, but by no means least, there is conductor-keyboardist Kory Danielson’s impeccable music direction of a fine 14-piece orchestra, with electronic music design by Ethan Deppe adding menace to the mix. All in all, it’s enough to make you click your glitter-dusted ruby slippers far more than three times, and to send you home with a whole lot more smarts, heart and courage. “The Wizard of Oz” runs through Jan. 6 at the Paramount Theatre, 23 E. Galena Boulevard, Aurora. For tickets ($36-$69) call (630) 896-6666 or visit paramountaurora.com. Running time is 2 hours and 35 minutes with one intermission. Note: Aurora’s downtown, whose rebirth is in large part the result of the extraordinary success of the Paramount Theatre’s seven-year-old Broadway Series (which can now boast a remarkable 40,000 subscribers), will mark another major milestone in making the performing arts the city’s great economic engine. Opening in June 2019, in a building adjacent to the theater, will be the new Paramount School of the Arts, whose mission is to encourage and train young actors and musicians, and further nurture the arts in the Aurora community.